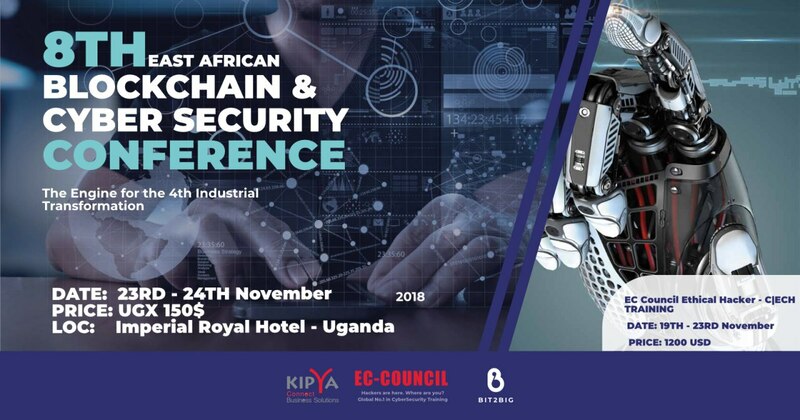 KIPYA Group and KIPYA | Bit2Big with its partners is holding the 8th E.A Cybersecurity & Blockchain Technology Conference in Kampala – Uganda. Organized by KIPYA Group Ltd, the conference will focus on the importance of this Industrial transformation and the endless opportunities it presents to all sectors of the economy. The 4th Industrial revolution brings with its new operational technology that will fundamentally alter the way we live, work, and relate to one another. In its scale, scope, and complexity, the transformation will be unlike anything humankind has experienced before. We do not yet know just how it will unfold, but one thing is clear: the response to it must be integrated and comprehensive, involving all stakeholders of the global polity, from the public and private sectors to academia and civil society. The event brings the first ever unique Cybersecurity & Blockchain Technology Conference and world class C|EH training. Our conference format is unique in a way it addresses latest developments and is led by the market best experts that have a proven track record and our CEH training is conducted along with experts from KIPYA Group, KIPYA | Bit2Big and EC-Council which is an institution accredited to conduct Cyber Security trainings worldwide with well-trained experts. Through keynote addresses, panel discussions, and relevant use cases, participants will appreciate the influence that cybersecurity and blockchain technology will have in the fourth industrial revolution setting in place mechanisms that arise with them. revolution. Come be a part of the first ever cybersecurity blockchain technology conference and training in Uganda.